The Cylons force the fleet towards a Cylon controlled ice planet where a powerful pulse weapon is pointed directly in its path. Commander Adama mentions they are still in the Epsilon Quadrant, which is the same one Kobol was found in in "A Death in the Family". This episode was also filmed after that, so it seems logical (along with some other clues mentioned below and in the study of "The Gun on Ice Planet Zero" Part 2, that this story takes place while the fleet is still in the Cyrannus galaxy, despite its original airdate order (which was after they entered a new galaxy in "The Long Patrol"). I have thus placed it before "The Long Patrol" in the timeline. The title letters of parts 1 and 2 of "The Gun on Ice Planet Zero" revert to the yellow color of the 2-part "Lost Planet of the Gods", suggesting again that this story takes place before the fleet leaves its home galaxy of Cyrannus. The story seems to be an amalgamation of three well-known Hollywood films, The Guns of Navarone (1961), Ice Station Zebra (1968), and The Dirty Dozen (1967)...and a dash of the Death Star thrown in. Richard Lynch portrays Wolf in this two-part story. Lynch later goes on to play Xavier on Galactica: 1980 and Count Iblis in Richard Hatch's proof-of-concept trailer for Battlestar Galactica: The Second Coming (which never evolved into a full project). Boomer mentions a game called 7-11, but we never see it played; it's unknown what kind of game it is. Possibly, the writers borrowed the name from the convenience store chain! It may also be a disguised reference to 21, otherwise known as blackjack, since 7 and 11 equals 21. An analysis of the ice planet appears on Rigel's screen at 4:35 on the DVD. It mentions di-ethene storms occurring on the surface. The novelization suggests that di-ethene is a gaseous waste product of the style of laser beams used by the Cylons, suggesting that the planet's buildup of di-ethene is due to the use of the Ravoshol pulsar. There is an actual chemical compound known as 4-di-ethene acid on Earth. At 5:17 on the DVD, a Cylon centurion is staring at a screen of moving, psychedelic colors for some reason. His dialog indicates that it is a long-range scan showing approaching craft, an intriguing interpretation of the colors...and he's right! At 5:22 on the DVD, we get our first (televised) look at one of the golden-hued command centurions (one is first seen, chronologically, in the comic book story "Baptism of Fire"). Viper scan information about the arctic mountaintop upon which rests the pulsar weapon appears on Athena's screen at 10:56 on the DVD. Boomer refers to Blue Squadron as Commander Adama's strike wing. The clothing worn by the inmates brought from the prison barge is ragged and torn, augmented by strips of mismatching cloth and crude stitching, suggesting that standard prison uniforms are not given to the prisoners. At 18:06 on the DVD, Commander Adama refers to approaching Cylon base ships as "Cylon battlestars". The painting of the Galactica seen at 18:07 looks like it might be one of the preliminary paintings produced by the legendary conceptual artist Ralph McQuarrie. The planet, Arcta, is described as being in a sunless system. So how are the characters (and the audience!) able to see on the planet's surface? It sure looks like daylight! Why does Cree's laser gun stop working after just one shot at 19:59 on the DVD? Must have been made in China. When Apollo tells Boxey he can't come along on the mission this time, he is probably meant to be referring to Boxey's earlier presence during the tylium scouting mission on Carillon in "Exodus". 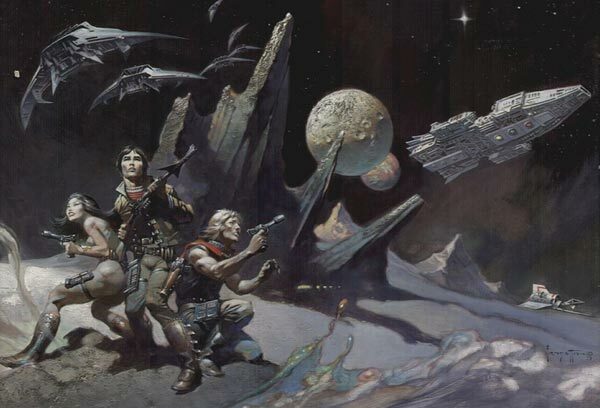 However, in our PopApostle BSG chronology, Boxey most recently accompanied both Apollo and Serina to the surface of Baalfarr in "Bane of Baalfarr". Apollo gives Boxey a medallion that was given to him by his father when he graduated from the academy. We never get a very good look at it. A couple different symbols appear on the boxes of provisions taken by the task force aboard the shuttle. In the first screenshot below, the top two symbols are similar to the Colonial emergency symbol, but have some extra lines in the middle. The bottom two I'm not sure of but, given that it resembles a crosshair, it may be a symbol meant to represent firearms. At 22:35 on the DVD, another symbol similar to the emergency symbol, but upside-down, appears, again with extra lines in the middle. The snowram appears to be the same vehicle as the landram (seen in "Exodus"), just painted white! The characters' parkas have a different colored patch on the right sleeve for different characters. We see red, yellow, blue, orange, and purple. They don't seem to denote rank, so what is their purpose? It seems throughout this and other episodes of the series that Boxey has a bit of hero-worship towards Starbuck. During his interrogation by Vulpa, Cree denies he is from the Galactica, claiming instead to be from the Columbia. Vulpa reveals that the Columbia was destroyed at the peace conference (though the novelization of "Saga of a Star World" tells us that Atlantia, Pacifica, Triton, and Acropolis were the battlestars lost there). During the discussion in the snowram, Boomer remarks that there are 220 ships in the fleet in danger from the Cylon pulse weapon. In our, admittedly retroactive, continuity, there are actually just 217 ships left in the fleet due to loss of ships in "Collision Course" and "The Last Hiding Place". Apparently, another term for "clone" in the BSG universe is "theta class life form". When Ser 5-9 refers to Dr. Ravashol as the "father-creator", Boxey asks Apollo if that means Ravashol is God. Apollo answers he's not God if he's with the Cylons. Ironically, in BSG2000, the Cylons do consider God to be on their side! The Arcta expedition is carrying solenite bombs. Solenite makes a few other later appearances as an explosive compound in the annals of the series as well. Notice that, as the expedition, led by the clone Ser 5-9, is making the trek to the mountain on foot at 43:43 on the DVD, Muffit seems to pause or stop behind a rock and Apollo picks him up and carries him! Possibly, the trained chimp in the daggit costume, Evie, preferred to stop and rest at that rock on repeated takes, so actor Richard Hatch just picked her up to keep the scene moving. One of the deleted scenes reveals that a member of the expedition, Colonial Warrior Vickers, was a member of the gun crew who held the rear guard at the Battle of Caprica. Pages 1-129 cover the events of "The Gun on Ice Plant Zero" Part 1. The cover seems to have been inspired by an Oriental style and was painted by the renowned artist Frank Frazetta, perhaps best known for his artwork of Conan the Barbarian. The painting was inverted vertically for placement on the cover of the book (the original is below). It's unusual in that it depicts Apollo wearing red stripes on his shirt, Starbuck wearing a tank top and Athena(?) wearing a one-piece bathing-suit type outfit! The image of the Galactica also has a decidedly Oriental look to it. The Adama Journal entry at the beginning of the book suggests that Croft met Adama at some point in the past and desires vengeance against him. It's later revealed in Croft's own journal that the theft of platinum from the Cylon outpost on Kalpa which is brought up by Starbuck while reviewing the prisoner files, was the occasion when he and his crew were stopped and arrested by Commander Adama. Like the first novelization in the BSG series, the Cylons are described as reptilian, with cyborg enhancements and armor. In the novel, it is the Imperious Leader, not Baltar, who is herding the human fleet towards the Cylon's pulsar weapon. On page 3, the Imperious Leader thinks of the human fleet as "mismatched", there not being a translation in the Cylon language for a Colonial prisoner's description of "ragtag". Page 3 also reveals the ice planet's Command Centurion, Vulpa, was exiled to the remote outpost for his outspokenness against the Imperious Leader's current strategy against the fleeing human survivors. Vulpa believed that, as long as they are fleeing, they should be allowed to escape rather than waste resources pursuing and trying to eliminate them. The Cylons seem to be obsessed with Starbuck. In the novelization of "Lost Planet of the Gods", The Tombs of Kobol, Lucifer was rather friendly with him during his capture and interrogation. Here, the Imperious Leader calls up a simulation of Starbuck in an attempt to understand the humans' erratic patterns of motivation and action. The human fleet is still using a camouflage force field around it, as described in the novelization of "Saga of a Star World". Page 8 reveals that the fleet has a former research ship called the Infinity that has been converted into a flight training facility for Viper pilot cadets. Page 8 also reveals that Boxey is 6 years old at this time. Page 9 reveals that there has been enough volunteers from the fleet to form 100 Viper squadrons, if only they had enough Vipers. On page 9, Commander Adama recalls attending space academy at the Caprican Academy. Page 9 also reveals that the fleet has converted a half-dozen freighters into foundries for building new Vipers. Page 12 tells us one of the foundry ships is called the Hephaestus. On Earth, Hephaestus was the Greek god of metallurgy (and other things). The Hephaestus is mentioned in the later novels The Nightmare Machine, Armageddon, and Warhawk. Page 12 reveals that Athena has turned down some important postings in the past in order to remain on the Galactica. Page 14 mentions the Universal Museum on Caprica. Is this the same as the Planetary Museum on Caprica, mentioned in the portion of the novelization of "Lost Planet of the Gods" covering "A Death in the Family"? Page 14 also reveals that the Colonial Movers ship recently turned back a squadron of Cylon Raiders single-handedly and the achievement was being praised in song and legend already amongst the fleet. This would seem to be an untold tale of the fleet. Page 14 reveals that the leader of Starbuck's flight crew is a woman named Jenny. She goes on to appear in The Nightmare Machine and Die, Chameleon! Also revealed on page 14 is the fact that Boomer is an expert on the botanical aspects of smoking devices. This harkens back to Boomer's own comment near the end of "Exodus", "She must have been smoking plant vapor." Page 21 mentions the planet Cassarion, a Cylon outpost. Page 21 also mentions the Sellian asteroid belt, the fragments of a world literally destroyed by the Cylons at some point in the past. How the destruction was achieved is not revealed. In "Berserker", the fleet discovers a Cylon satellite in orbit around a planet which they detect has a link to an explosive charge set deep in the crust of the planet that will detonate it, so it's possible the Sellian asteroid belt fragments were formed by a similar Cylon device. Page 23 reveals that, early in the Thousand Yahren War, the Cylons had a method of powering asteroids across space for combat purposes. This is reminiscent of the Cylons attempt to destroy the Galactica with an asteroid in "Doomsday Rock". Page 32 refers to Vulpa as a Warrior of the Elite Class. Page 32 reveals that the mountain upon which the pulsar has been built is known as Mt. Hekla. In the televised two-parter, we don't learn this until part 2. Page 38 reveals that some Cylons are known to write poetry. Also on page 38, the Imperious Leader's hologram of Starbuck reveals that a nickname for Commander Adama among the crew of the Galactica is Ironhull Adama. The entry from the Adama Journals on pages 41-43 tells of a (apocryphal?) story from Starbuck's days at the academy. Page 42 reveals that one euphemism for the bathroom at the academy is "the Cylon throne room". Page 48 describes Vulpa as having black strips across his metallic armor to designate him as a Warrior of the Elite Class, rather than having the gold armor as depicted in the TV episode. Also on page 48, Cree's cadet uniform is described as looking different from that of a warrior's, so there was no insignia to prove he was from the Galactica. In the episode, he appears to be wearing a normal warrior's outfit, so he should have been easily identifiable as a member of Galactica's crew to Vulpa. Again on page 48, Cree recalls that he has been taught that, if captured, to give the enemy no more than name, rank, and classification number. Obviously this detail was inspired by the rules of the Geneva Convention here on Earth, which requires a prisoner of war to give only name, rank, and number. Page 55 reveals there is a difference between Cylon warriors and workers. What may be workers are glimpsed in "The Living Legend" Part 2. On page 60, Leda tells Croft to shut up, "I'm not taking any more of your birdlime." I was not familiar with the term "birdlime". It turns out it is a sticky, adhesive substance used to trap birds. While Apollo and Croft argue about mountaineering on page 67, it is revealed that the second-highest mountain on Caprica is Mt. Cyimklen. Page 70 describes the expedition as having, among its mountaineering supplies, ropes of Aquarian hemp, which can become either stiff or flexible with a right or left twist of the rope's end. In the book, the gunnery sergeant's name is spelled "Haals" instead of "Halls" as it is in the televised episode. In the TV episode, Boomer is picked by the computer for the mission because of his past duty on Ice Station Thula while Starbuck programs the computer to add his own name to the roster as well. In the novel, Starbuck adds both of them into the computer himself with a false record of them having served at Aeriana Ice Station. In the Adama Journal entry on page 108, he wonders if they will be able to restore/recreate their lost books and entertainments from the Colonies when they finally outrun or defeat the Cylons or find a planet to welcome them. The reference to "a planet" sounds as if Adama harbors at least some doubts about being able to find the specific planet Earth. One of the lost books Adama ponders on is a young adult novel called Sharky Star-rover about a boy who flees his home to find freedom and adventure with an alien friend. On page 109, Adama's reminiscence of Sharky Star-rover includes the detail that young Sharky's father was a hophead, indicating that "hophead" refers to some sort of addictive behavior. In American slang of the early 1900s, "hophead" was a term used for opium users. Page 113 suggests that the fleet is divided up into sectors named after what we know as the letters of the Greek alphabet. Colonel Tigh refers to some of the rear sectors as "Sigma through Omega". On page 128, Vulpa compares the elusive human expedition on Tairac to a type of insect on an unnamed Cylon world which is attracted to the shine of Cylon armor and which crawls in between the seams of the armor to cause irritation and damage to the Cylon's inner workings.